Getting Under Bob Grogan's Skin? 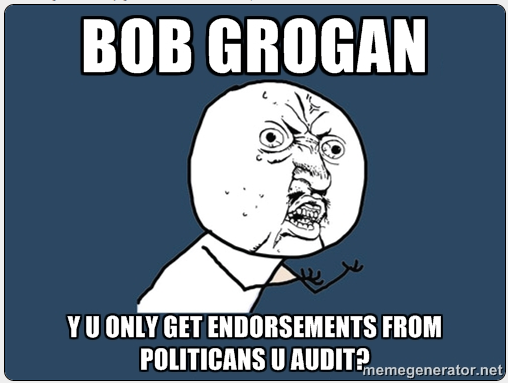 Guess our little Meme from yesterday about Bob Grogan securing endorsements from the very elected officials that he audits has gotten to him a bit? He's gone ahead and blocked the Truth Team on Twitter. Bummer. Now we won't know what he's up to. Oh wait...we can just look at his timeline. But...getting blocked at least warrants a little bit of a celebration, right? And how does the Truth Team celebrate? With a Meme, of course.